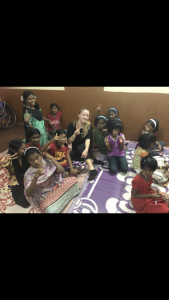 After our two-week class ended we had to say goodbye our new friends and travel to Chennai. 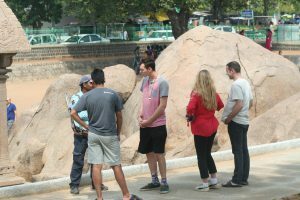 The cultural phrases and slang picked up from working with an international team were crucial to avoid getting scammed in Chennai. Everywhere we went dozen of street vendors would come chasing after us and would try to sell us something. After having a minor experience with this in Hubli, the group and myself were able to avoid falling for their traps. On the last day in Pondicherry a vendor came up to me and tried to sell me fake RayBans he kept trying to put them in my hand and with every step I took and tried to genuinely walk away, he kept lowering the price. “1200 rupees, bhaiya(translated: brother)”, then “1000 rupees, bhaiya” and then “400..300”. I was not interested and regardless of how many times I said no, he would keep following me around the market. Ultimately I found the only way to get him to leave me alone was say an absurdly low amount and watch him walk away from us. I responded to his sales pitch with 10 rupees. Although this was a brutal and rude way of getting him to stop pestering us, it ended up working. 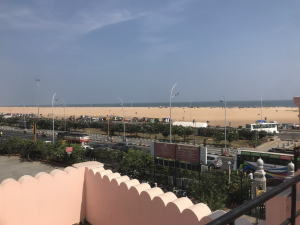 Our time in Chennai was a blast and I would love to go back! Wow! That trip was amazing! I had so much fun and learned a lot from this study abroad experience! I learned that there are more than hundreds of ways to think about a solution to however simple a problem is. Everyone is different and can interpret each thing differently. Being able to hear them voiced in class opened my eyes to new ways of thinking of things. The last day of the course was the hardest, even harder than the final test itself! The bond we created with one another with the Indians at KLE and China towards the end of the trip was tight-knit! 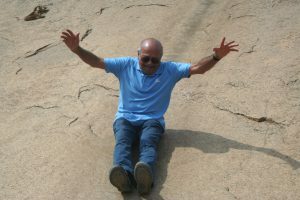 I did not want to leave my friends behind in Hubli! I no lie, teared up on the last day! I never cry! My team was the best; we worked on NeoMotion Wheelchairs. It was the best because we all communicated and were all on the same page. We all had more or less same personalities, which I think helped out a lot! All in all, I would like to thank Prof. Mehta for this amazing opportunity and would love to study abroad again at some other location! I have waited so long to finish this last blog post because I can’t bring myself to accept that our trip is actually over. There are SO MANY stories, memories, and adventures that I experienced but I couldn’t possibly talk about them all so I’m just going to list a few favorites. 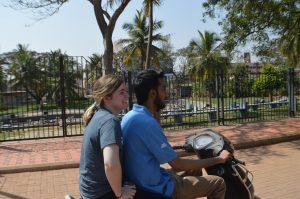 For starters, there is nothing more thrilling and happiness inducing than a ride on the back of a scooter in the streets of Hubli. Before going to India I had always been too afraid to ride on a scooter or a motorcycle so I never tried. I don’t know if it was the fact that I wasn’t feeling well and didn’t want to take public transportation or the fact that I had already adventured to the other side of the world so why not conquer another fear while I was at it, but I jumped on the back of Abhishek’s scooter and never wanted to get off. From that point on I snatched any ride I could on the back of someones (usually Ameen’s) scootie. This trip also helped become a more confident and somewhat aggressive (in a good way I promise) person. I’ve previously been a timid person when it comes to conflict and usually keep quiet even if I am somehow being wronged in a situation. 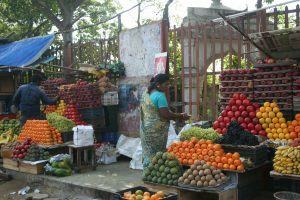 But let me tell you, arguing over prices or money and yelling at vendors in Hindi who are admirably persistent is quite a rush. On our touring trip after leaving KLE we stopped for lunch at a coffee shop where I ended up being owed Rupees from the cashier and I had a hard time getting it back. As soon as the disagreement started I had Professor Mehta, Sahil, the tour guide, and Sean all at the counter ready to argue on my behalf. 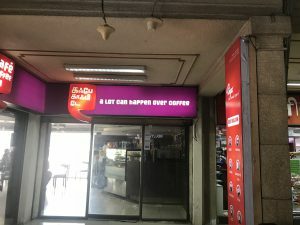 The five of us took turns voicing our complaints and then also all shouting at the same time, luckily the cashier had enough of our drama and threw 100 Rupees right at us. In hindsight we were arguing over a little over $1 but when in India…. All I’m saying is a lot can happen over coffee. 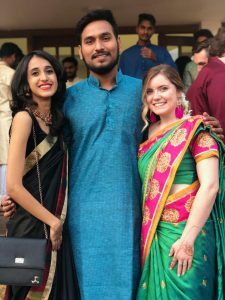 Another one of my favorite memories was ethnic day. Getting dressed by the Aunties who came to wrap our sarees was one of the greatest feelings. I felt like a princess. I wish I had the ability to put my saree on myself so I could wear it all the time. Seeing everyone else all dressed up was incredible as well. All the different colors and accessories and smiles plastered across everyones faces. We were so excited to get a closer look at Indian culture and the Indian students were beyond happy to share it with us. We had a fashion show and everyone had the chance to rock the runway, even the professors themselves! 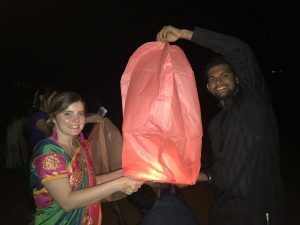 Our night ended with sending lanterns into the sky (except for the one that set a temporary fire that didn’t harm anyone!) with one another to end a good night in Hubli. Our final day in Hubli was full of tears as we parted ways with our friends that had felt like family. We weren’t ready to leave each other quite yet, two weeks wasn’t long enough to learn all that we wanted to from one another. In our last days together we made promises to see each other again, hugged tight and often, and spent all the time we could with each other. Time seemed to move so fast and before we knew it we were driving away from the scholar house and on our way to tour for the next 5 days. 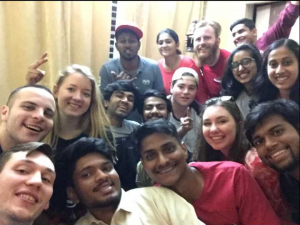 I am so thankful for the friendships I made in Hubli and I will miss it until I return again. The very best time I had during my trip was spending time with genuine people who were willing to share parts of themselves that you can’t see on the surface. It opened my eyes to see that beyond culture, language and distance from each other, we are all still very similar and want the same things. It was an experience that I could never duplicate and would recommend to anyone. Thank so you so much Professor Mehta for encouraging students to experience something different (not to mention sticking up for us when the tour guide brought us to unfavorable places), and Professor Ciuchta for being a great travel companion even though Delhi wasn’t my favorite place to visit in India. This program is beyond words and I hope it continues to give students the same experience that I had! Just like that, two and a half weeks are gone and past. 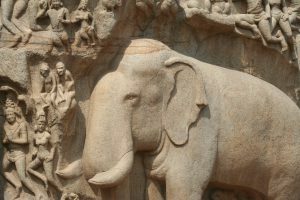 What a great way to see and experience India. 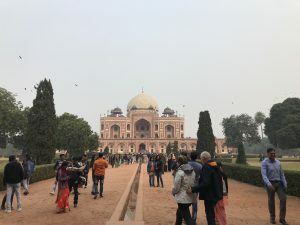 Between our pre-course trip to the Taj Mahal, the program at KLE, and the post program tour, I feel like I got a good helping of what India has to offer. The coursework was really good. I thought it was a good balance of lecture and practical work and I enjoyed the parts where we got out of the classroom and worked as a team. As part of our team’s project we needed to conduct interviews with surgeons at local hospitals. I was quite skeptical about how it would go when we showed up at these hospitals. The first hospital we arrived at went very much as I expected. We waited around for awhile until we eventually got to speak to the administer who told us that no one would be available to talk to us and that we should come back another time. However, the visit to our second hospital completely caught me off guard. When we arrived at the second hospital, we were only waiting for five to ten minutes before we were shown into the surgeon’s office. Not only was he a surgeon, but he was also an instructor of surgery. He was extremely polite, happy to help us, and very informative. The interview went great and he provided us with some critical customer input. Not only was his own interview a great success, but he also gave us the contact information for a couple of other surgeons and told us that we could use him as a reference when reaching out to them. We even got a photo with him. When we finished the interview, he said we’d have to excuse him, because he was supposed to be in surgery! What a great experience! This is one of the big takeaways that I had from this course. When developing a product, you not only have to ensure there are customers for your product, but you 100% need to reach out to those potential customers and get their input and feedback. This primary research is critical in product development. It is going to be very time intensive, and some of that time will be wasted and you’ll never end up talking to someone. However, the information you gain from those potential customers that you are able to reach is priceless to an entrepreneur’s endeavor. Do whatever you have to in order to make those interactions happen and get the input of your customers! Lastly, I really enjoyed the post session tour, especially going to the tomb and martyr sites of St. Thomas the Apostle. 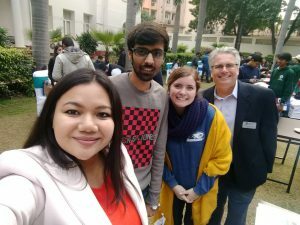 Thanks for a great time in India! As I write this blog post I am on my second flight of the day on my two-day excursion to Delhi. 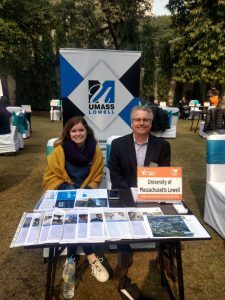 I was given the opportunity to represent UMass Lowell at an international college fair for Indian students looking to study abroad in the U.S. 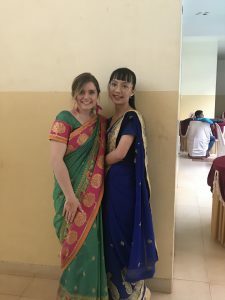 Although I am very excited and thankful for the opportunity to visit a region of India that I otherwise wouldn’t have had the chance to see, I am also missing my new friends back at KLE. 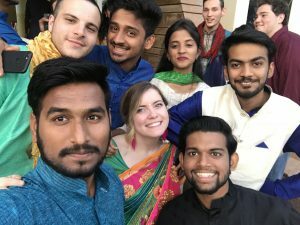 Me and the other American students have already created such close bonds with not only each other but also with the Indian and Chinese students in the program. We all come from such different regions, backgrounds, and cultures, but we are also so similar at the same time. 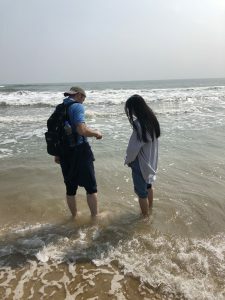 From the time we wake up to the time we go to bed we share as much as we can with one another, whether it’s knowledge on the subjects we’re learning, educating one another on our own customs and cultures, or just exploring the area around us. I’ve already received “I miss you” messages from a few of my new friends, Aakanksha, Naveen, and Chirag. Aakanksha is one of the sweetest people I have ever met. From the first day we were placed in the same project group she has shown me nothing but kindness and love, as if she has known me for a lifetime. She explained to me “Athithi Devo Bhava” which means that Indians respect their guests as gods. Even if she accidentally kicks my foot under the desk she will apologize and do a quick prayer. I have never experienced such kindness from a person that I have known for only a week. In the U.S. I interact with so many people in one day and by the end of the day most of those faces and experiences leave no impact. In one single day in India I pick up knowledge, experiences and interactions that leave me happy, grateful, and excited to learn more. Even our classes and assignments have come with an excitement that you can’t duplicate in a U.S. class setting. On January 2ndeach project team was given 500 rupees (roughly 7 dollars in America) and we were told to invest the money in anything of our choosing and somehow find a way to make a profit back. Immediately every group had started plotting ideas that would result in the largest return. My group started throwing out ideas like reselling Indian jewelry, online click advertisements, personalized paintings, and even selling real life kittens. Some of these ideas were a bit far-fetched however, so we ended up deciding on candy grams for students to send to one another within our hostel. The first problem we had with this idea was explaining what on earth a candy gram was to the Indian and Chinese students. I hadn’t realized how American the idea was until it took me 5 mins to explain that it was essentially a candy delivery service with a personalized note attached. But once we overcame this speed bump we were open for business. 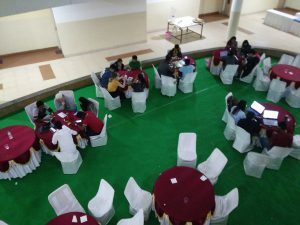 While our team was in search of customers, every other team was hard at work making items by hand, bartering with one another, and looking for any possible way of making a quick profit. It was an amazing sight to look down from the 2ndfloor of the scholar house and see students interacting with intent during all hours of the night. 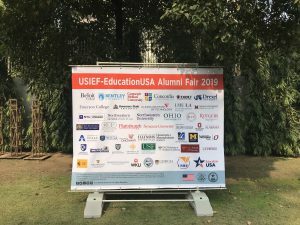 All of the items the American and Chinese students had brought as gifts had turned into a way to make a quick profit. Although we had all become so close by that point, we were acting as business men and women and friendships were put on hold for a few days. At the end of it all I ended up with mehndi, Chinese bookmarks, artwork for my family, and other homemade gifts. I likely paid more than I needed to for these items but all the profits we made went to charity and it was too fun not to join in on the bartering. So far, I am having a wonderful time, learning more than I thought I would, and looking forward to what comes next! 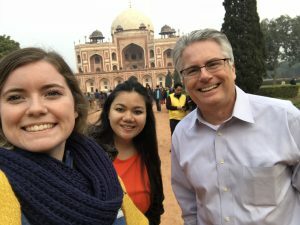 Thanks for the memories, India! The culmination of the GE2 program involved lots of turbulence on the plane ride home, tons of fun the last few days in Pondicherry and Chennai, and some really heartbreaking goodbyes. 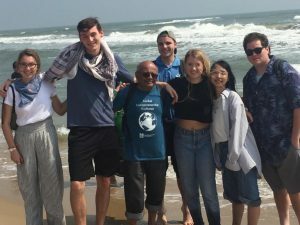 I never thought it would be this difficult to leave India, but I found myself feeling bittersweet when the plane took off from Pondicherry to Boston. I was excited to see family and friends – but I was leaving so much behind. 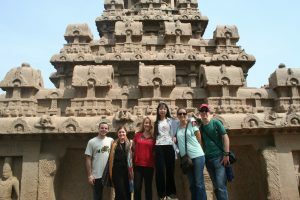 I would forever treasure these memories with my new friends from India and China. Crossing the street for the first time seemed ages ago – the Americans all linking arms and shrieking as bikes drove a little too close – now we were seasoned experts and walked with ease through the crowded streets. The mini rush of adrenaline was an everyday part of our lives at that point. Eating noodles, naan, and trying various spicy dishes at the restaurant across the street from the university was a regular lunchtime occurrence. 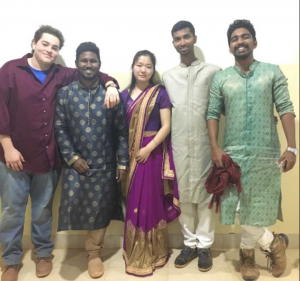 We shared stories about our hometowns and laughed about how different America was from India…Cows in the street, while normal in Hubli, would cause mayhem in the streets of Lowell. I formed friendships over fried rice and garlic naan, then raced back to the classroom so we wouldn’t be late for the afternoon lecture. We would even miss the classroom experience which seemed tedious at the time but, in retrospect, made all the students so much closer. 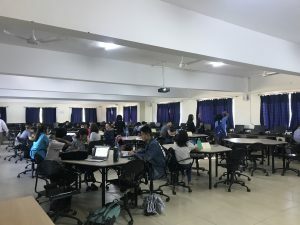 Especially during the last night before the project was due…everyone was huddled together in the dorm with our laptops and a nervous energy permeated throughout the whole building. Personally, I wasn’t sure if we would finish our project in time, and I was certain I would stumble over my words. But I gained confidence just by being around the supportive environment of my peers. When the teams presented the following day, everyone cheered after every group presented their project. Who knew I would find such a strong support system halfway across the globe? … All of these moments would completely change my outlook on travel, meeting new people, and experiencing new cultures. 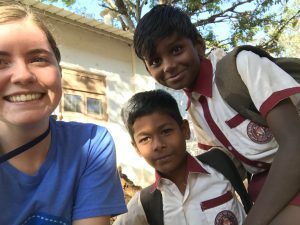 At this point in the program, I never wanted to leave India. 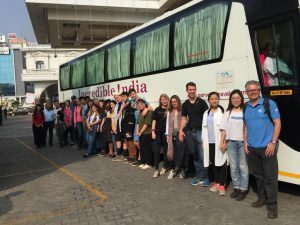 After a tearful goodbye from KLE University and the Indian students who we became so close to, we departed for sightseeing in Chennai and Pondicherry. The temples, architecture, and churches were incredible. 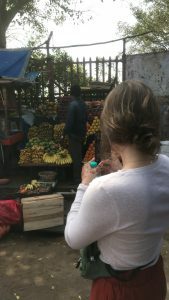 We walked through marketplaces learning how to bargain with shopkeepers and how to ignore hagglers who would follow you for half a mile before realizing you weren’t going to buy their products. 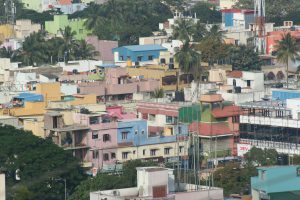 At one of the churches in Chennai on top of a mountain we could see the whole city. 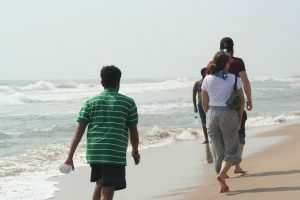 We made our way to Pondicherry where we spent the day by the ocean, dancing spontaneously and basking in the sunlight. On the last day, we got to the airport extremely early – we couldn’t even check our bags in yet. But our group made the best of it by hosting “talk shows” within our group, reminiscing on the trip, and making sure that everyone had enough snacks to hold them over until we would head for Boston. After a long flight, we landed in Boston and I said goodbye to my UMass Lowell friends. And after spending a few days in the US, I can’t help but feel a certain sadness of not being in India anymore. 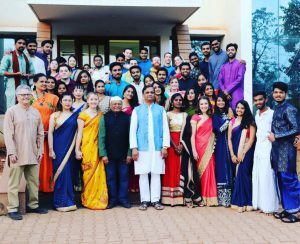 This experience and the people I met have changed me for good; I know for sure that I will go back and visit because a part of my heart is still in Hubli. 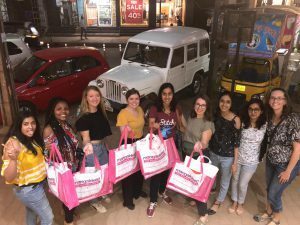 Here’s to many more adventures and friendships that will last forever – all because some strangers decided to spend three weeks in India and ended up having an experience of a lifetime. As class drew to the end, it felt like time had flown by. One of my most memorable experiences is visiting a local orphanage to donate the money we raised from the 500 rupee challenge activity in class. I was unsure of what to expect when we arrived at the orphanage. We first walked into the office and met a man who was in charge there to explain how we had raised the money we were donating. He then insisted that we meet the children so he led us into another room. There, all the children sat down in front of us and took turns introducing themselves. Right off the bat, I could tell that they were extremely nervous. After we introduced ourselves and explained why we were there, we started to interact with them. At first, it was hard because we did not speak the same language and they were very shy. But, before long I discovered that the girls liked playing hand-clapping games so I taught them some games that I knew and they taught me a few themselves. Before I knew it an hour had past and it was time to go. Before we left they showed me their bedrooms and were calling me deedee which I was told means elder sister in Hindi. I was so glad to have visited the orphanage because it made me feel like a kid again to play games with them. With a tearful goodbye, we left the Indian students in Hubli and ventured off to Chennai. We spent the next few days on an awesome tour bus making stops at historical sights and fantastic views. One of my favorite places we visited was the beach because we took a boat to get there. I loved sitting in the boat and looking at the coastline. When we got to the beach there was coconuts for sale, horseback riding available, and even a spa for your feet that had the little fish that exfoliate your skin. We all ran around on the edge of the water and just enjoyed the beautiful weather. Now looking back, this is a simple memory that I will remember for a lifetime. I am so thankful to have had the opportunity to make memories like this with unforgettable people. After a great two weeks in Hubli, we flew across to Chennai. 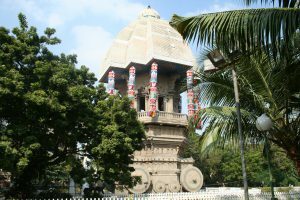 Chennai was more of a city then Hubli and had traffic like you couldn’t imagine. After a short drive from the airport, we arrived at an amazing hotel. We were welcomed with shell necklaces by the hotel staff and put in a real high-quality room, it was a great entrance. Everyone was sad that they had to leave their new friends in Hubli, but we still got up early the next day to start the tourist side of the trip. We saw a bunch of beautiful, colorful Churches and Temples that were built hundreds of years ago by hand. They were amazing. 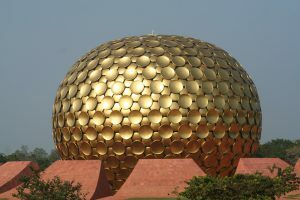 We got up the next morning and got on the bus to Pondicherry, making stops along the way at popular attractions. The sites were all amazing, drawings and buildings carved into rocks – things I’ve never seen before. I really enjoyed driving from Chennai to Pondicherry. Just looking out the window was amazing, seeing small villages with goats, cows and bulls everywhere, palm tree fields – it was cool to see. Once we got to Pondicherry, it had a different feel to it then both Hubli and Chennai, almost a European feel to it on some streets, but of course still with the crazy traffic and scooters everywhere. Pondicherry was on the water, and we took a trip to an island one day which was a lot of fun. It was hard to leave India and I can’t wait to get back there some day. The entire trip was a huge success in my eyes and Professor Ashwin Mehta and Professor Mike Ciuchta could not have done a better job. Thank you for making this happen for us and for our university. It was great. 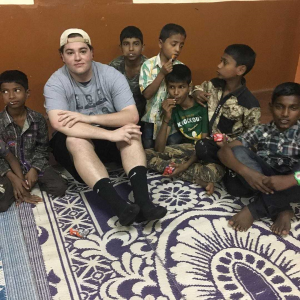 I would highly recommend this trip to anyone and I will never forget the friends or the memories made while in India. I strongly believe this trip changed me for the better and anyone would be lucky to have the experience we had. 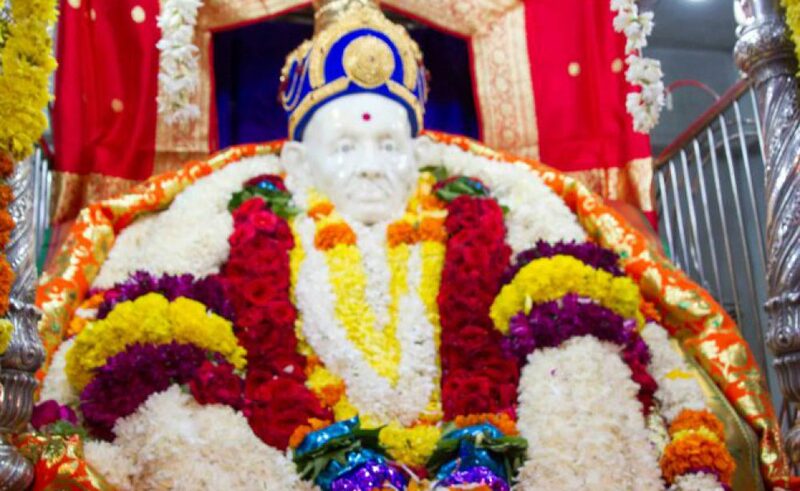 The first two weeks in Hubli could not have been better. The projects were going great and we were all having a great time. At the end of the two weeks there was some hard goodbyes for everybody, and we all were reflecting on our experiences over the past weeks that we’ll remember forever. 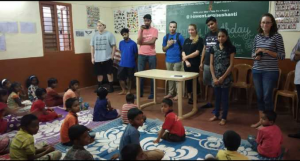 Before leaving Hubli, a few of us went to a local orphanage to donate our profits from the 500-rupee challenge. In total we raised about 35,000 rupees as a group. After walking to the front gate and haggling a handful of rickshaw drivers looking for the best price for a ride, we took off knowing very little about what we were about to do. It was always a real thrill taking the rickshaws, weaving at high speeds in and out of traffic, not knowing if you’ll make it to your destination – they were a lot of fun. Once we arrived, we looked around confused for a while, but eventually found the gate in and waited in the office for the man who runs it to get the kids situated. We walked into an old classroom where 30 or so little kids sat staring at us, amazed. Neither us or them knew what to expect from this. They were being very respectful and quiet at first, unlike your typical little kids, but once we tried to make it fun for them, playing games, music and running around, they let loose and were having a great time. We decided to go across the street and buy a bunch of lollipops and chocolates so each of the children felt like they got a little something. The girls were playing games and doing one another’s hair, while I was playing catch with a bunch of the boys. I would throw it out and they would all battle it out for it, while the younger kids would come up to me and ask if they could borrow the ball, then continue to run away, time after time. They were still learning English, but I figured they were saying something along those lines after it happened a few times. I showed them a few videos of Tom Brady at work after they saw him on the background of my phone and were curious. Some kids were shouting his name by the end of our time here. It was definitely one of my favorite parts of the trip and an unbelievable experience I am very happy to be a part of. I cannot believe that my trip has finally come to an end. 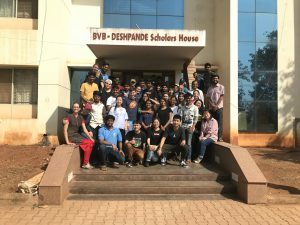 It started to feel real once we had to say goodbye to our Indian friends at Scholar House in Hubli. That was really hard for me because I could not imagine continuing my trip the next week without them. We all became so close and that place felt like home. I have never met a more amazing group of people in my life. 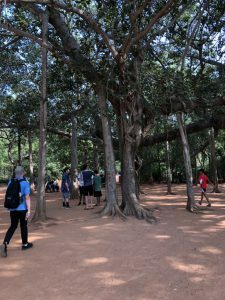 Before going, I was not sure how everyone would connect with each other but the connections went beyond my expectations. I write this with a heavy heart that I will miss them all forever, or until we meet again. Luckily, we still got to keep the Chinese students for another week. 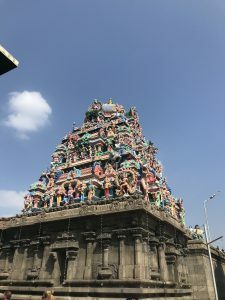 My time in Chennai and Pondicherry were great too, and we got to see a lot of cool things. We visited temples, churches, beaches, and other great sites that I will never forget. I even enjoyed the long bus rides because we were all together and sometimes relaxing, looking out the window, and listening to music is happy time for me as well. Also, the hotels we stayed at were beautiful! Some complaints about the last hotel, but I will not waste my time on that. I would hate to complain about any second of this trip because I would do anything to go back there even if it was at my worst time (there was no “worst time” because I loved everything!!). Furthermore, it just felt nice to finally have a softer bed or a better running shower. However, I would sacrifice those things if I could go back to Scholar House and do it all over again. I would not trade this experience for anything in the world. The classes, culture, sites, and learning were all great, but for me it was mainly about the friendship. I went on this trip because I was at a time in my life where I felt my most lost and loneliest. I pushed myself to come on this trip because I needed adventure and something different. I went alone, not knowing anyone, and leaving with a family. I have never been that consistently happy for three weeks in my whole life. I would like to take a minute to thank and shout out the people who had a hand in any of this being possible. Thank you. It truly changed my life and I am forever grateful and humble for this opportunity. Now being home for a day or two, I feel lost and alone. My heart hurts and I miss everything and everyone. I know this will pass and it is only the post-vacation blues, and once I am well rested and able to reflect on the positives that this trip left me with, I will smile about it forever. I will always have a friend in all the Indian boys who took me on a ride on their scootie, and the beautiful Indian girls dressed up in their Sarees. I could never forget Kuku, who was my rock and made me feel more loved and appreciated than anyone else I have ever came into contact has made me feel. Also, my American friends who I now get to see at home and can continue our friendship. I have never met a more unique group of people who I now think of as family. I will never forget how I felt for those three weeks: happy, warm, loved, and accepted; all the things I was going there to remind myself that I could feel again.